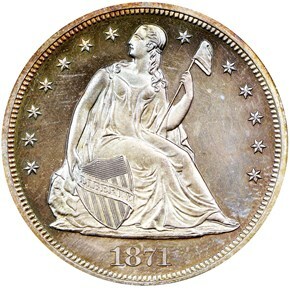 Liberty Seated dollars of 1871 had the second highest mintage of the With Motto type, both of business strikes (1,073,800 coins, exceeded only in 1872), and of proof strikes (960 coins, exceeded only in 1870). It would be reasonable then to think that a proof of this date should not be difficult to locate. And that is true in a relative sense, however, most grade no higher than PR64. The Seated dollar marked a return to the production of silver dollars, which for all practical purposes had not circulated since the release of 1803-dated coins in 1804. 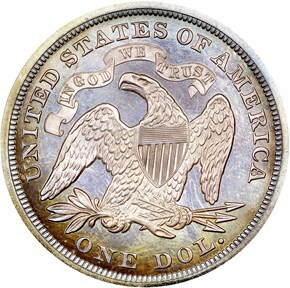 Engraver Christian Gobrecht adapted sketches of Liberty by artist Thomas Sully and of 'Old Pete,' the Mint's eagle mascot, by artist Titian Peale to produce a coin that we know today as the Gobrecht dollar. In 1840 Gobrecht's magnificent eagle reverse was replaced by an older 'sandwich-board' John Reich eagle design, but the Liberty on the obverse remained essentially the same. A banner with IN GOD WE TRUST was added to the reverse in 1866. 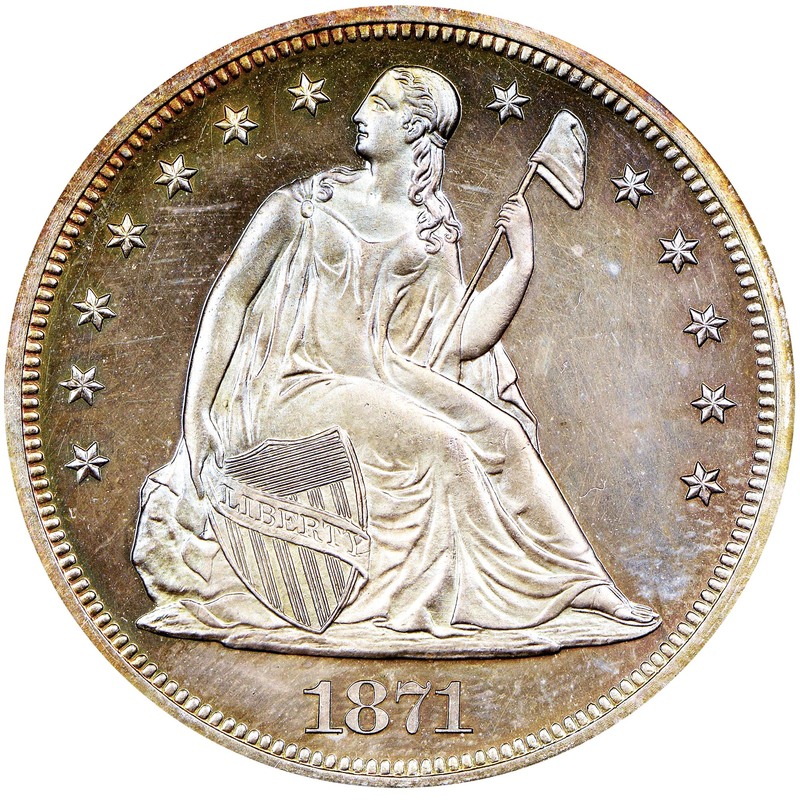 Redundant with the gold dollar for domestic commerce and part of the long running gold vs. silver conflict, the Seated dollar nevertheless saw extensive use in international commerce as bullion, face value irrelevant, until the series ended in 1873.